Gold Cross Dye Stripper is used to remove Gold Cross Dye from garments without any harmful effects to the fabric. This allows a previously dyed garment to be stripped back to a lighter shade and re-dyed, which is useful for those dyers who like to update their items regularly. Stripper is also useful as a general-purpose stain remover and is gentler on the clothes than bleaches and other generic stain remover products, which attack the integrity of the fibres themselves. 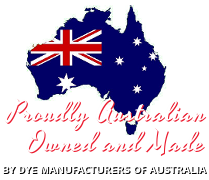 Stripper may also be used in removing dye runs that occur when coloured garments are washed with whites. The white garment may be brought back to their original state by rinsing them in a light solution of stripper. Warm water is suitable for this particular application. The dye runs should quickly be removed. Garments need to be rinsed well after stripping.